Just over a month ago I spent a rainy morning in the fields, pulling up the remainder of the beet field at the UBC Farm alongside a cheery group of fellow volunteers. It was a wet and miserable day, but while we were all soaking wet in and under our rain gear, we were hardly miserable ourselves. There were some HUGE beets in that field.“Monster beet”! “It’s as big as your head”! Such exclamations kept us crawling forward, motivated to find ever larger and more impressive beets. There’s nothing like a massive root vegetable to get these people excited. And now, I too can call myself the type of person who enjoys digging through the mud for such things on a cold, wet Friday at 9:30 in the morning. We were swimming in beets that day. With limited time and resources available, we had been instructed to take only the best beets, and to leave anything smaller than a golf ball. A practical decision maybe, but a waste of the most tender and delicious of the beets. So we did what we had to do. We organized a beet rescue operation. Our mission was clear: no beet left behind. As we worked, we gathered the culls into piles, and left them in the field. When the last tote of beets went up to the harvest hut after many hours of numb fingers, we went back for the rescue beets. Those rescue beets were perfect, perfect for pickling. A small beet is tender and sweet, but it still has that strong, savory flavor. They are just the right size to pop straight into your mouth. Stupendous. And my favorite part about pickling beets? The very first step is to boil them, and then all you need to do is give them a little squeeze, and the juicy little morsels just jump right out of their skins. You probably knew that. But I didn’t. You should have seen my face the first time I tried it. I used a recipe adapted from Canadian Living to pickle my rescue beets. It glosses over the steps involved in safely canning food, and I will as well. A much more comprehensive post on how to can safely is on my list of future projects. Proper canning methods are very important because of the risk associated with the bacterium clostridium botulinum, which causes botulism. If you’ve never canned before, I recommend these resources here and here to get up to speed. It may sound a bit intimidating, but it’s really very easy. For me, the scariest part actually occurs months later, when I’m ready to pry open a sealed jar. Like I did today. You may feel like you’re quick enough to dodge the inevitable wave of beet juice, but it always manages to find your favorite sweater. Always follow exactly the amounts of vegetable, vinegar and water set out in the recipe when pickling, otherwise the preservation may not work properly. The spices, on the other hand, can be experimented with to your liking, as I did here. 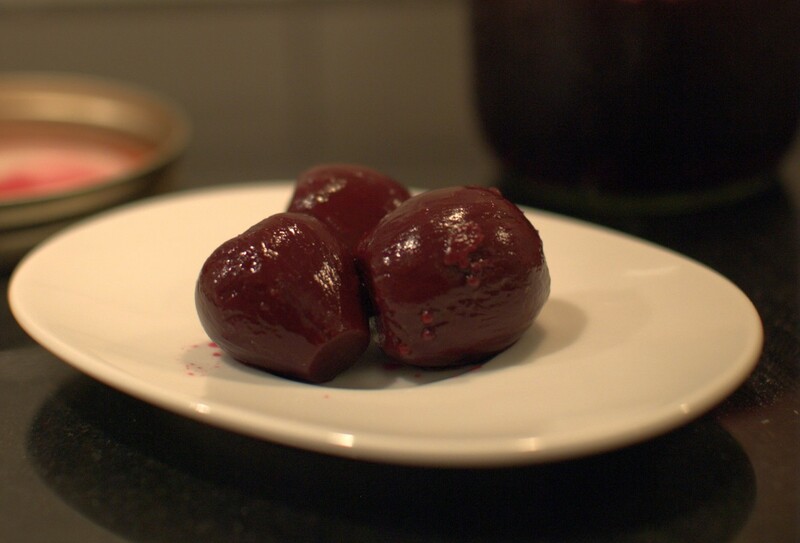 Cook the beets in boiling water until tender (about 30 – 35 minutes). Remove from heat, drain, and leave to cool. Slice off the ends and roots, and then slide the skins off with your fingers. If beets are too large, half or quarter. You’re after golf ball sized pieces (~1&#189 inches). 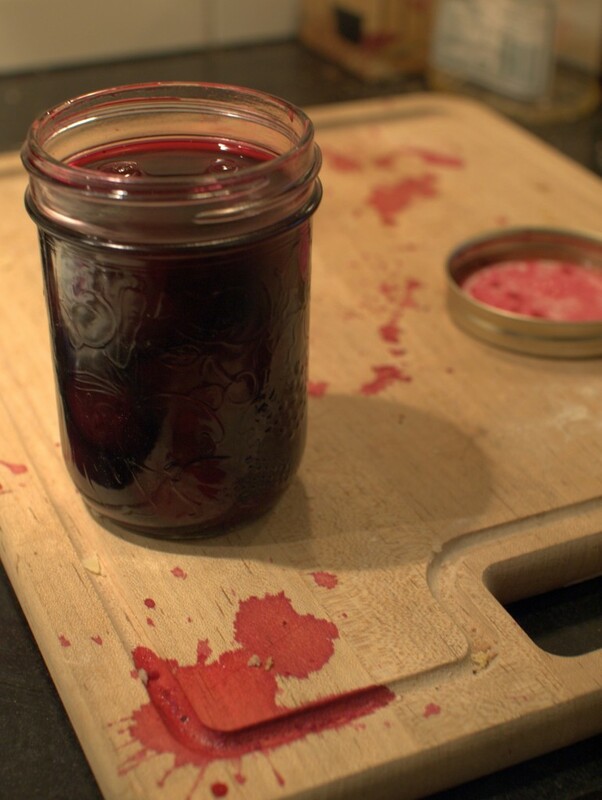 While the beets are boiling, sterilize your jars and lids. I ran mine through the dishwasher. The cycle took just long enough that they were done around the same time as the beets, and the dishwasher kept everything hot until it was needed. Bring the vinegar, water, sugar and salt to a boil in a large saucepan, until the sugar and salt are dissolved. About 5 minutes. Place the spices in the jars. Pack the beets in tightly, up to about &#190 of an inch from the rim. Pour the vinegar mixture into the jar to cover the beets (if you’re a klutz like me, you may want to use a funnel), leaving about &#189 inch of room at the top. Cover the jars with the lids. Screw on bands until tight. Fingertip tight is fine, you don’t need to strain. Place the jars in boiling water, but make sure the jars aren’t touching each other or the sides or the bottom of the pot, otherwise they may break. I used a tea towel in the bottom of the pot because I don’t have rack. Boil for 30 minutes. Remove from the boiling water, let cool, and listen for that satisfying ‘POP’ of the jars sealing. Yield: Makes 4 2-cup jars. Note: If you’re not as excited by the prospect of letting your beets marinate for months on the shelf, and find yourself saying “this is all fine and dandy, but I want pickled beets now“, then you could also try a quick pickling recipe like this one over at Simply Recipes. Or at least, here I go again. Most of you probably have no idea where I am going with this. You see, I have this blog. Or rather, I have a domain name and server space, with blogging software installed on it, but which contains very few actual posts or any writing at all. The latter is perhaps the more honest description, but let’s just call it a blog so it can feel good about itself. Actually, we might even want to call it secret blog because I am pretty sure no one but the web bots have ever scanned its sparse pages and prose. After Perpetually Astonished first came into being as the byproduct of my exam-induced procrastination, I don’t think I ever wrote a single post. I imagine that many a great thing in this world has been created by students looking for a way to avoid studying, but my blog certainly wasn’t one of them. When I tried to make another go of it this spring, I decided to write about technology, design and human computer interaction (HCI) because that’s what I know. I thought I’m working on a Master’s in HCI, I am brimming with opinions and there are scads of interesting things to talk about! It was perfect, I was set to blog. And while I very sincerely meant to embrace that topic and write like crazy, I just couldn’t get the words out. At last count, I have 7 unfinished drafts just sitting in the queue, and I have zero desire to finish any of them. Realizing that I am not passionate enough about what it is that I supposedly ‘DO’ to actually write about it has been a real eye-opener. I think that I am only just beginning to suspect what that really means for me and my potential career in computer science – but that’s a conversation for another time. The real point is this: I miss writing, and I want to be better at it. I recognize that the only way to do that is to write, write, write. So this time I am going to try writing about something that I am certain I love, and that I have proven myself capable of talking about indefinitely. Food. While I consider myself a competent cook, I know I have leaps and bounds further to go, and I want to start challenging myself to learn everything that I can learn. I am not making any promises on what you should expect to see here, but I suspect you’ll be happy if you’re interested in either recipes, or reflections on the many, many, many kitchen failures in store for me in the future. And before you even say it. . . I know, I know. Food blogs have been done to death. But despite my lack of any real expertise or training, food and cooking are some of the only things in life that I actually feel qualified to talk about. If the best that comes from this blog is writing practice and an archive of family recipes, then I shall be delighted! So screw it. I’m doin’ it. Here on out, I’m a food blogger. What’s the worst that that could happen? It’s just pots and stuff, right? You are currently viewing the archives for November, 2011 at Perpetually Astonished.